2017 Dania Beach Vintage Motorcycle Show. I got there early. You could not have taken this photo once the crowds arrived. 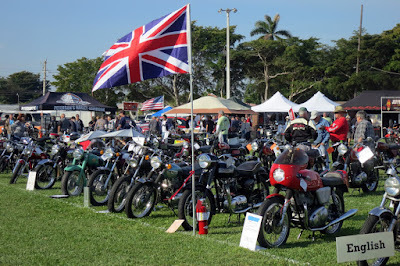 The 2017 Dania Beach Vintage Motorcycle Show Saturday was marvelous, the Florida weather was glorious, and my 1999 Royal Enfield Bullet ran better than ever. Naturally I gravitated first to the section of the show devoted to English motorcycles. 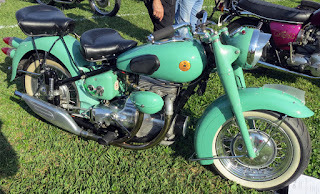 An impressive 1948 Sunbeam S7 shown by Chris Noe of Miami caught my eye. 1948 Sunbeam S7 makes an impressive sight. The Sunbeam logo is a radiant sun! The Sunbeam logo shines forth. 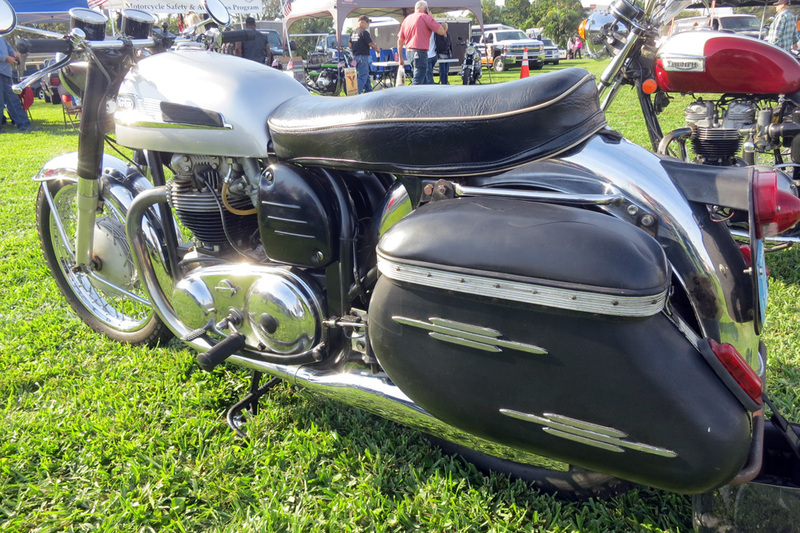 This Sunbeam featured a rear seat on a custom removable frame and Cadillac tail lights that look better on the motorcycle than they did on the car. A note on the motorcycle explained that the tail lights were an "original mod from the '50s." 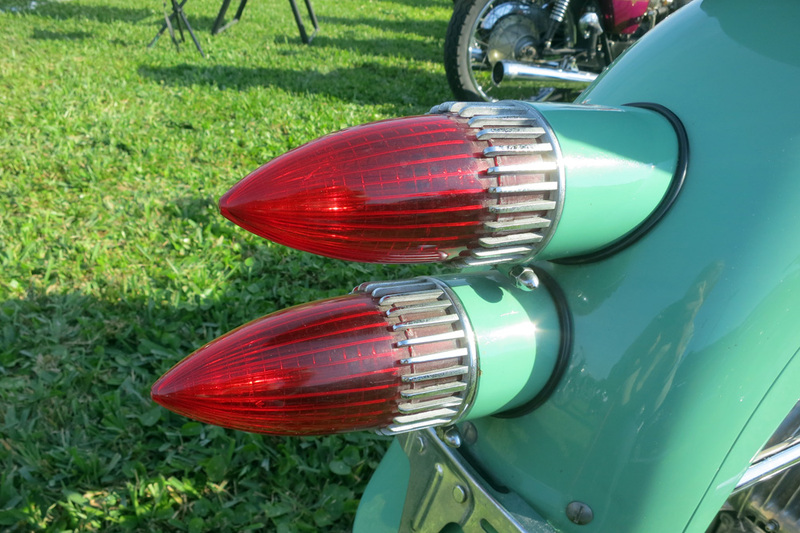 Cadillac tail lights brighten the Sunbeam. 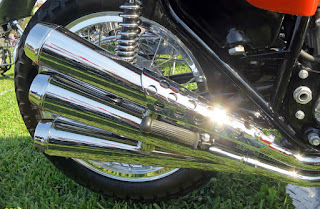 The hand-pump horn didn't seem to belong on the sleek Sunbeam but I liked it. Hand-pumped horn announces the Sunbeam. 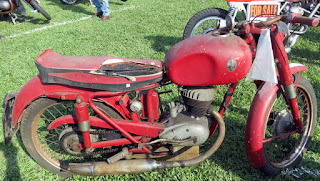 My eyes next devoured the 1973 Triumph X75 Hurricane entered by Mark Bromley of Homestead. What a pipe organ this triple carried. 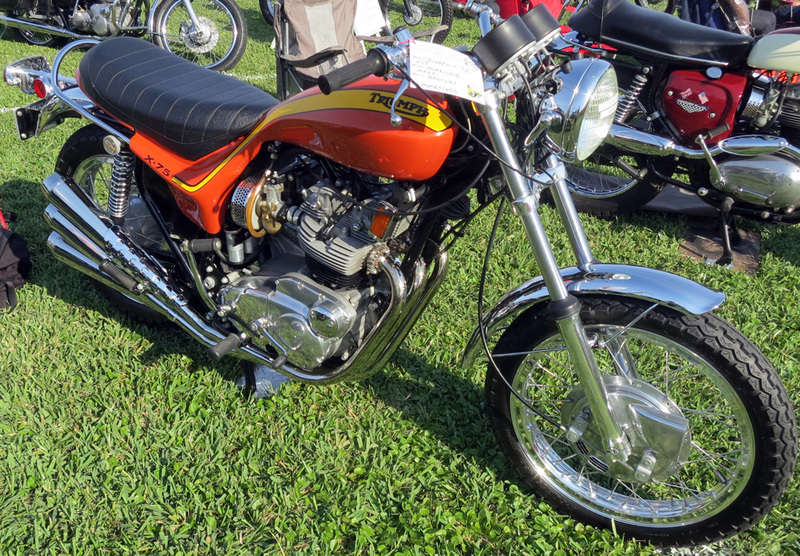 1973 Triumph X75 Hurricane triple. ...and its magnificent pipe organ. 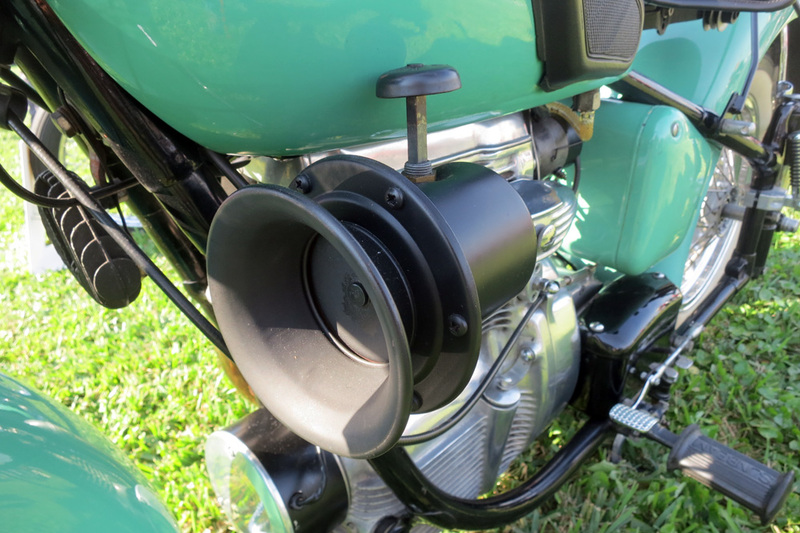 The 1966 Norton Atlas of Kevin Riggott of Cooper City mounted vintage looking luggage. 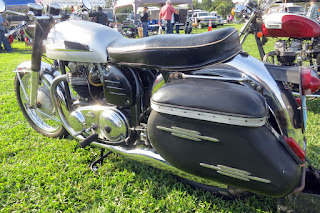 Vintage side luggage flows with the lines of 1966 Norton Atlas. 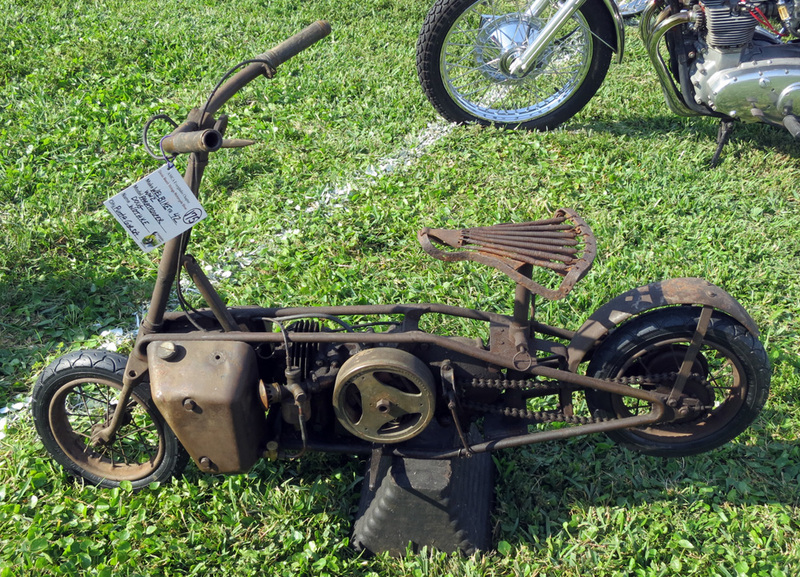 The 1942 Welbike of Doug Wothke of Punta Gorda claimed duty as a "World War II paratrooper," a good old soldier still refusing to fade away. 1942 Welbike deserves "Best Flywheel" award. 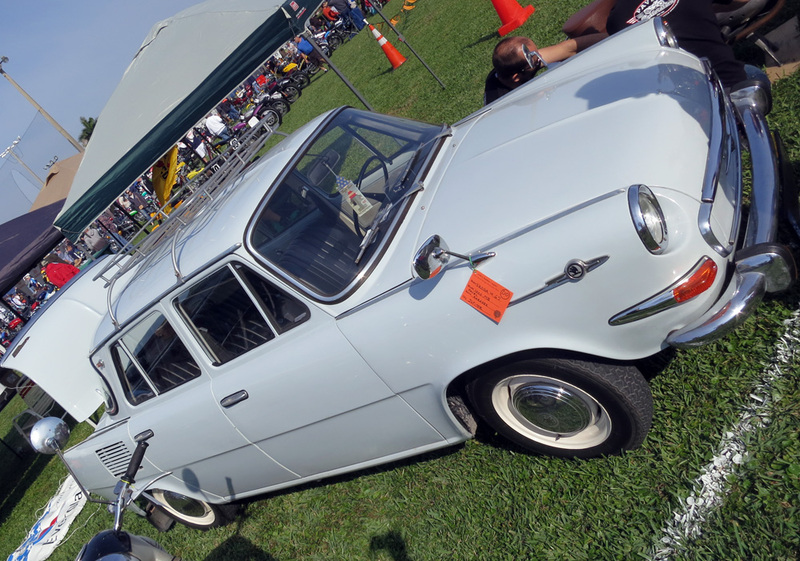 No motorcycle show is complete without an interesting car and this year's four-wheeler was the 1967 Skoda 1000 MB of Pavel Karasek of Jupiter. The Czech car's roomy interior and roof rack looked ready for its owner's next vacation. 1967 Skoda 1000 MB's happiest days are ahead. Never expected to see a Maserati motorcycle but here one was, wearing years of patina and the Maserati trident logo. The battered little beater proudly wore its handlebars cafe racer style. 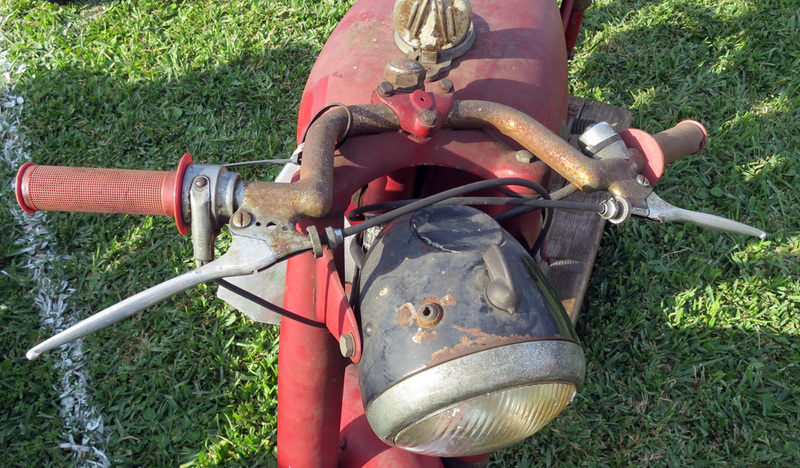 A Maserati motorcycle has seen happier days. ...but its trident logo is still proud. And the handlebars are ready to race. 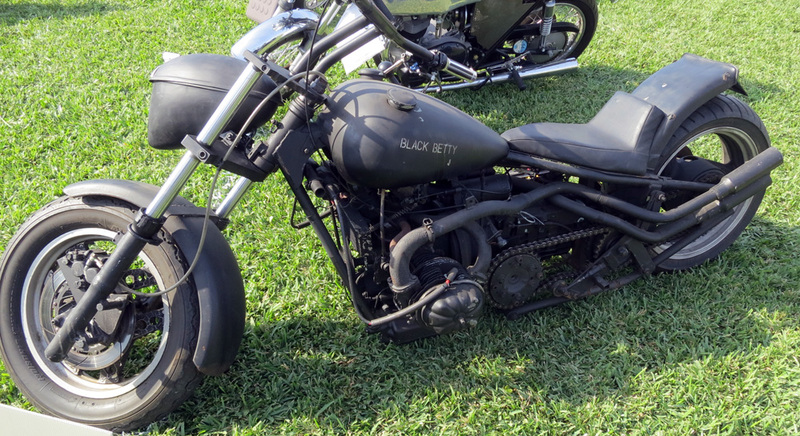 The dramatic Black Betty rat bike was another surprise. That's a Citroen 2CV motor it carries. Black Betty, a big motorcycle with the motor of a small car. 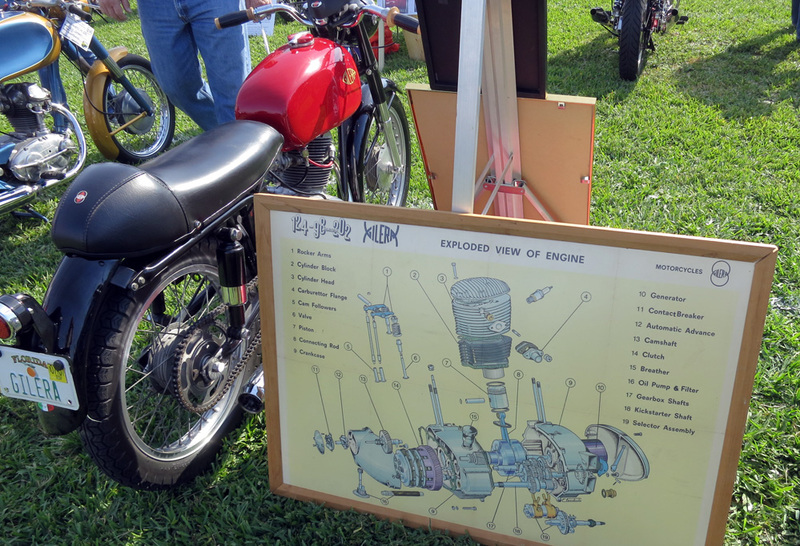 A Gilera helpfully displayed an "Exploded View of Engine," which did create a certain image in the mind. Gilera with exploded view of motor; just in case? And a 1916 Indian Power Plus shown by Doug Wothke of Punta Gorda carried a tool kit complete with hammer and the advice that "If you can't fix it with a hammer, you probably have an electrical problem." 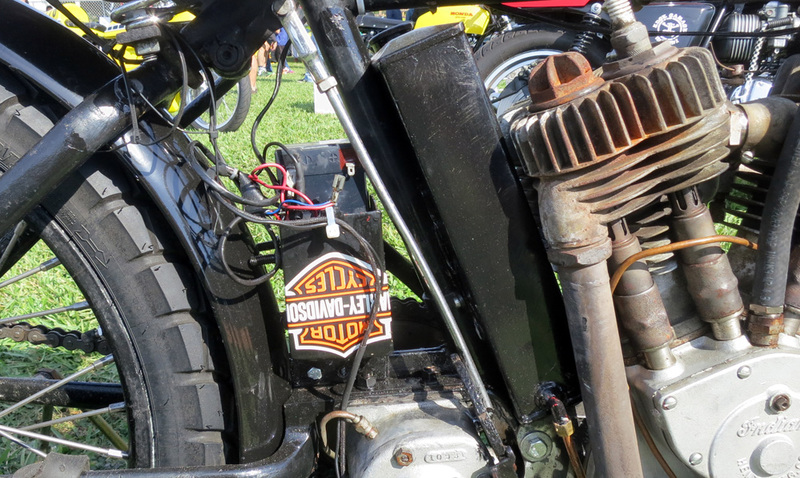 It also carried a Harley-Davidson sticker, upside down, a subtle touch. 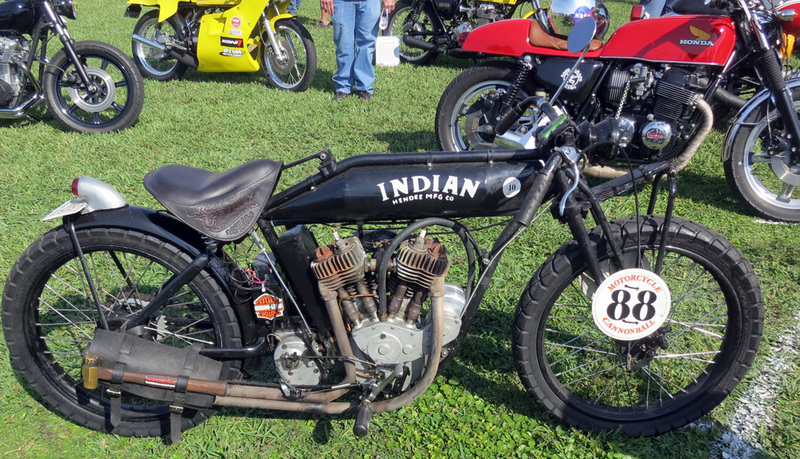 1916 Indian Power Plus with Cannonball Run number plate. 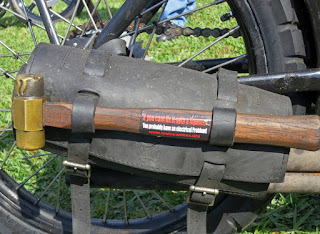 You mean your tool kit doesn't have one of these? What is this Indian trying to tell us about Harley? 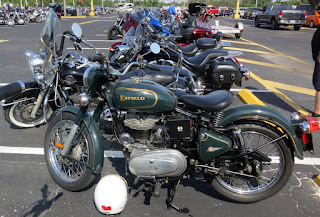 I said my Royal Enfield ran better than ever, the fruit of the tinkering I've been doing lately on the shift linkage. But, just to remind me not to get over confident, it left a dash of oil on the ground in a place I'd never seen one before. My Royal Enfield. Note small spot of oil on ground near center stand. Well, it shook loose and lost the small bolt that plugs up the drain hole of the catch basin for the sump vent. No taking a Royal Enfield for granted, ever. I felt that I was there, David! Thanks for the great photos and reporting - sorry about your bike's latest drips. Thank you, Steve. Great weather for riding here this time of year.